Do you love the ocean, scenic views and all kinds of grilled food? Then join us for a relaxing drive and tour along Casablanca’s coast! Our four-hour tour and culinary outing will depart from the famous Hassan II Mosque. Once outside of city limits, we’ll enjoy a leisurely lunch at a traditional Moroccan grille-style restaurant where we’ll select fresh meats for barbecuing. Afterwards, you can dip your toes in the sea and enjoy coffee with a view. If you like, allow time to independently tour the interior of the Hassan II Mosque before (at 10 a.m.) or to walk around the exterior after (3:30 p.m.) your coastal drive and lunch. Your hotel should be able to verify that mosque tours are running at their regularly scheduled times. The Casablanca coast and Corniche is a popular destination for locals and tourists alike. Most days, the wide sidewalk running along the ocean is utilized by families, business colleagues and others who are out for a scenic stroll. However, walking is optional on this Casablanca tour. Your experience begins at the famous Hassan II Mosque, where you’ll join a local tour guide for a drive along the famous coastal road as it takes you from Casablanca out toward the quiet beach town of Dar Bouazza. On the way we’ll stop at the El Hank Lighthouse, where you may be able climb to the top for a stunning view, and continue on to the Corniche and Anfa for lovely views and photo taking. 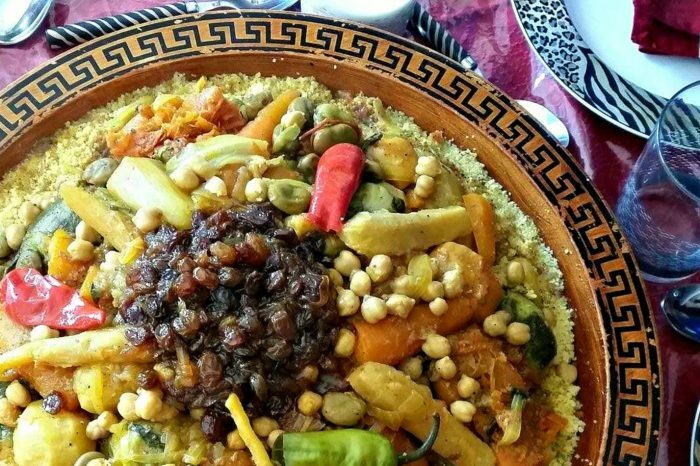 Once at our destination, you’ll settle in for a traditional Moroccan lunch at a popular grille-style family restaurant. We’ll select fresh meats and offal to be grilled to order while salads, Berber flatbread and a tagine will round out the meal. Afterwards we’ll stop for coffee at a beachside cafe where, weather-permitting, you can walk on the sand and dip your toes in the ocean. – Parts of this experience are not wheelchair or stroller accessible. – Please note that we can’t guarantee that high chairs or booster seats will be available at the restaurant. – A minimum of 2 adult participants is required for the tour to run. – Solo participants are welcome to join a tour that has existing bookings, or they may buy two adult places to guarantee that a new tour will run for them. If you’re a solo participant who chooses the second option, please let us know in the comments field when booking online; should another party book on the same day, we’ll refund the second ticket after the tour has taken place. You’ll connect with your guide outside the Visitor Entrance at Hassan II Mosque.